When photos of President Barack Obama laughing and taking selfies with the prime minister of Denmark, Helle Thorning-Schmidt, began to surface on the Internet, people were eager to spin the photos as though the popular ABC drama "Scandal" were being acted out in real life: President Obama, a stand-in for the fictional President Fitz, flirting with a pretty blond version of Olivia Pope, while his angry wife looked on. When Michelle Obama was photographed sitting between Thorning-Schmidt and Obama, some claimed she made her husband switch seats to put a stop to his flirting. Lost in the fictitious stories about out-of-control husbands and angry wives was any mention of the Mandela memorial itself – including President Obama’s warm and enthusiastic reception before the South African crowd, and his powerful eulogy of Mandela. MSNBC’s Irin Carmon argued that the president and first lady were the victims of stereotypes of the “oversexed black man” and the “angry black woman.” It is fascinating that so few people saw simply two heads of state engaged in friendly banter – as they might have if Thorning-Schmidt were a man, or a less conventionally attractive woman. 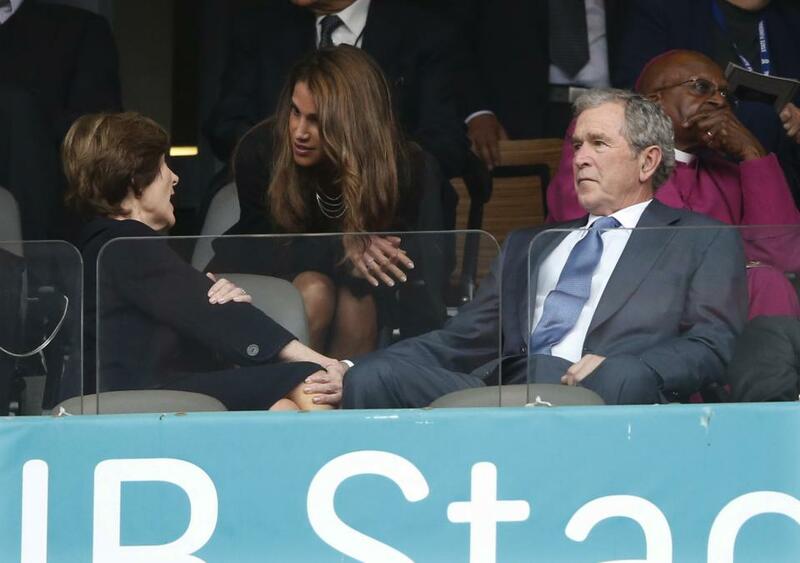 A photo of former President George W. Bush chatting with Queen Rania of Jordan while Laura Bush stared straight ahead was subjected to similar treatment. The New York Daily News ran the picture, along with the Obama selfie photo, in an article with the breathless headline, “Presidents behaving badly? Obama, Bush get looks from wives over funeral flirtations.” In the article, Laura Bush was said to be “less than thrilled” about her husband’s chat with the “stylish” queen. Not surprisingly, an image showing Laura Bush having her own conversation with the queen while her husband stared off into the distance never made the rounds. Many people have defended the endless tweets about the photographs of the Obamas and the Bushes as simply jokes -- and, to be fair, a lot of the Twitter commentary that has been derided as racist and sexist was silly and jokey in context. But behind those jokes lie uncomfortable and persistent stereotypes about women -- first, the notion that an attractive woman, even one in a position of power and authority, will always be, first and foremost, a sexual object to men; and second, that wives will always be jealous of their husbands’ interactions with attractive females, even when the interaction is professional -- or work-related. And as cases in which women have been fired for being "too pretty" show, in the real world, these stereotypes can lead to devastating consequences for women. In July of this year, the Iowa Supreme Court ruled that a dentist did not violate gender discrimination laws when he fired his dental assistant because he found her attractive, and he and his wife worried that the attraction was a threat to their marriage. Critics were justifiably outraged at the decision. Legal analysts, in particular, worried that the case set a dangerous precedent that would allow men to avoid liability for workplace discrimination and sexual harassment because they simply couldn’t help themselves. The idea that the mere presence of an attractive woman employee might tempt her vulnerable heterosexual male boss to break his marriage vows was long used as an excuse to keep women out of the workforce, and then to keep them out of leadership roles. Even after the Iowa ruling, the notion that a man cannot control himself working in close quarters with an attractive woman seems outmoded and absurd. “Selfie-gate” suggests that these attitudes remain with us, unspoken and beneath the surface. But if women are to continue to make equity gains in employment and leadership, we need to get rid of our lingering fears that close working relationships among men and women are time bombs of sexual tension that can threaten marriages. Reducing the Danish head of state to the status of blond bimbo is insulting and offensive. And presuming that wives like first ladies Michelle Obama and Laura Bush cannot handle their husbands’ relationships with attractive female world leaders is both a slap in the face and a step backward for feminism.